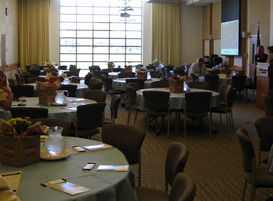 Whether you want hors d’oeuvres and cocktails, a wine and cheese bar, or a full dinner, the Conference Center catering staff can accommodate your needs. For a sample dinner menu, please see the Lunch entries in the attached menu. 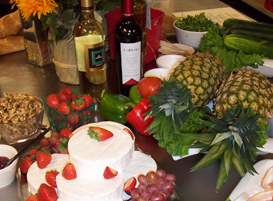 For team building events, you should consider our “Notable Chef” program, where your team participates in the planning and preparation of a fine meal – and then enjoys the meal together. A great way to build teamwork – and to enjoy a fine meal.